World News -- ThedDiplomat.com: Is China Undermining Its Own Success in Africa? ThedDiplomat.com: Is China Undermining Its Own Success in Africa? 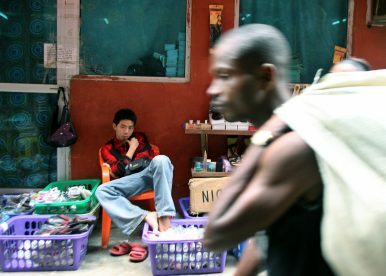 An unidentified man walks past a Chinese trader in Lagos, Nigeria, in this Aug. 1, 2002 file photo. Chinese influence, money, and people blanket Africa. Mega-infrastructure projects such as Kenya’s Standard Gauge Railway (SGR), the light railway in Ethiopia’s capital, and Tanzania’s ports, are all pointed to as evidence that Africa has become China’s backyard. Countries like Japan, France, or even the United States simply cannot compete against China for trade and influence in Africa. This is the story that one reads in Japan, the United States, Europe, and Africa itself. But it is important to understand that this is only part of the story. First, Africans and their leaders are the decision makers when it comes to projects related to their countries’ development and future. Some projects are popular and useful, while others are frankly a waste of time, money, and resources and may destroy livelihoods. For example, the Bui dam in Ghana, built by the Chinese company Sinohydro, was planned and constructed without the consultation of locals, ignoring key issues such as health, livelihood security, and adequate compensation for those affected by rising waters. However, the dam proved expedient politically and financially to power brokers in the capital, Accra, so the wishes and concerns of the locals were ignored. On the contrary, projects such as roads construction in Nairobi, Kenya, with various roads being built separately by Chinese and Japanese companies, have proved popular as well as partially alleviating the city’s notorious traffic gridlock. These examples lead to the second point: the inevitability of Chinese power and durability in Africa is not only exaggerated, but increasingly questioned by Africans and their leaders. This is good news for countries such as Japan, with its lighter touch combining targeted development with business acumen and high-tech expertise. Indeed, Japan’s way of doing business may prove more than a match for China in terms of longevity and impact in places like Kenya or Mozambique. There is no doubt that China is currently dominant on the continent of Africa. In East Africa, the primary location of my research, Chinese projects and people seem omnipresent. For example, disembarking at Addis Ababa International Airport one could be forgiven for thinking that he or she has arrived in a far-flung statelet of China given the Chinese flags, banners tied to construction cranes, and an army of Chinese workers. A 2017 McKinsey & Co. report counted “more than 10,000 Chinese-owned firms operating in Africa today.” The extremely dated 2012 Annual Report on Overseas Chinese Study said the African continent was home to more than 1.1 million Chinese immigrants, a figure that possibly now approaches 1.5 million or more. Compared to numbers like these, Japanese expats and businesses operating in Africa, for example, represent only a handful. So Japan, the United Kingdom, and other countries much be losing, right? Not necessarily. While the reasons for this are complex, it seems that Chinese economic and social practices coupled with the sheer numbers of Chinese operating in Africa may end up destroying much of what has been built thus far. Chinese attempts to blanket the continent are starting to draw the ire of African leaders and common citizens alike. Reports of unpalatable Chinese behavior and business practices are now the norm rather than the exception. These negative accounts generally revolve around what could be identified as the four pitfalls of Chinese power projection in Africa: racism, debt, direct competition with locals, and labor relations. Taken together they represent a toxic stew that may soon bubble over. Reports of Chinese racism against Africans first surfaced, not surprisingly, in China as Chinese came in contact with students from Nigeria, South Africa, and Senegal. But as increasing numbers of Chinese have decamped to Africa as part of an effort by Chinese officials to alleviate a serious labor glut, the attitudes and prejudices incubated back home often surface in relations with local Africans. This manifests itself not just in the shocking rants of a Chinese boss in Kenya comparing Africans to monkeys, but in a string of reports about Chinese men impregnating women in West Africa and then abandoning the children to return to China. If new social ills abound, the spiral of debt is nothing in new in Africa. Yet the sheer scale of African debt to China achieved in the past decade is staggering. While the picture is checkered across the continent, many countries owe significant sums to China, particularly given less-than-robust economic outlooks or economic monocultures across much of the continent. For example, according to DW Angola has taken out “oil-related loans worth $21.2 billion since 2000,” which “equals roughly a quarter of cumulative Chinese loans to the entire continent.” Kenya, an economic powerhouse on the continent, by contrast owes $5.3 billion dollars in loans to China. Of Kenya’s total bilateral debt, 72 percent is owed to China. The scale and interest rates associated with the debt have many economists and politicians worried. Their fear is that African leaders have bought the Chinese mantra about not meddling in African internal politics – in contrast to Western practices – while forgetting that significant strings may be attached to Chinese loans now and for years to come. For example, the case of China’s takeover of the debt-ridden and moribund port of Hambantota in Sri Lanka has not been lost on many Africans. Furthermore, some see evidence of China calling the shots in the recent sacking of Zimbabwe’s nonagenarian president, Robert Mugabe, in favor of his successor, Emmerson Mnangagwa. While it is true that Chinese loans often are approved much quicker that Japanese or Western loans, they can come with strings attached, including steep interest rates as well as material and labor demands. “The Chinese do often insist that their equipment is used and often also their people. Workers from rural areas of China, who would otherwise be unemployed in China, now come and work on these projects,” William Gumede, Professor of Public Management at the University of the Witwatersrand in South Africa, told DW. Many Africans, it should be noted, are happy the Chinese are building and refurbishing major infrastructure in the form of roads, bridges, ports and railways. As one Kenyan friend recently told me, “We may owe China lots of money, but Kenya now has a railroad.” Less welcome, however, is direct competition from Chinese traders and the flooding of local markets with cheap Chinese goods. In Dakar, Senegal, locals are angered at the prospect of being pushed out of the apparel market by increasing numbers of Chinese traders who have set up shops stocked with Chinese goods imported directly from China and sold at cheaper prices. Across the continent, a Chinese man was spotted selling roasted maize close to the University of Zambia in 2015. In Lesotho, cakes, cigarettes, and drinks sold at retail prices by Chinese traders — and in direct competition with some of the country’s smallest and poorest traders — cause consternation. Flagrantly unfair labor practices and discrimination against African employees are another sore spot. A recent expose by Paul Wafula highlighted how Kenyan workers on the SGR are forbidden to smoke or use their mobile phones while working. Chinese workers have no such rules. Kenyans are not allowed to sit at the same tables as Chinese and have only been allowed to operate the new train along the SGR’s 472-kilometer length once since it opened in May 2017. What I am now hearing from colleagues and friends in places like Nairobi and Addis Ababa is that the combination of massive debt, racism, and on-the-job discrimination, as well as direct Chinese competition in the informal economy, is crystallizing into something approaching a negative stereotype in the minds of many Africans. This means, in some cases, that China may find itself and its business in Africa unwelcome. This obviously opens the door wider to investment and business by other countries such as Japan. Indeed, Japan is in a particularly good position to capitalize on just such a development. First, Japan is a known quantity in Africa, having been involved in many countries since their independence in the 1950s and 60s. This means that while Japanese goods and services often come with a more expensive price tag, the quality and timeliness of the project is assured. This is what I term the “trust factor” that works in Japan’s favor. Second, Japan is not a former colonial power and thus comes to Africa with none of the strings attached that hinder the U.K., Italy, France, or even the United States. Africans realize they can get the best possible goods and services – products and projects they can trust – along with relevant transfers of knowledge. This is something the Chinese have avoided offering, thus scoring Japan another goal in this competition. Third, Japan is not China and offers Africans another East Asian alternative for infrastructure development and trade. The difference here, along with those listed above, is that Japan offers reliable and timely projects without Chinese extortionate interest rates. While Japan may not be able to compete on scale with China (no one can), it can certainly position itself to take advantage of a situation wherein Africans begin to question what many are now seeing as their overreliance on China. *Brendon J. Cannon is Assistant Professor of International Security at Khalifa University of Science & Technology, Abu Dhabi, UAE.